Are you planning a fun vacation to take this August? The summer is winding down and kids start school soon, so it is a great time to do so. Speaking of kids, planning a vacation is a lot harder than when you didn’t have kids. And the drive to your vacation destination was a whole lot quieter and less complicated. In fact, some people might say traveling long distances in the family vehicle with kids can really get on your nerves. The key to this is to find ways to keep your children occupied while driving across the country. You can’t expect a coloring book and a few crayons will keep them occupied for hours on end. You need to be creative. 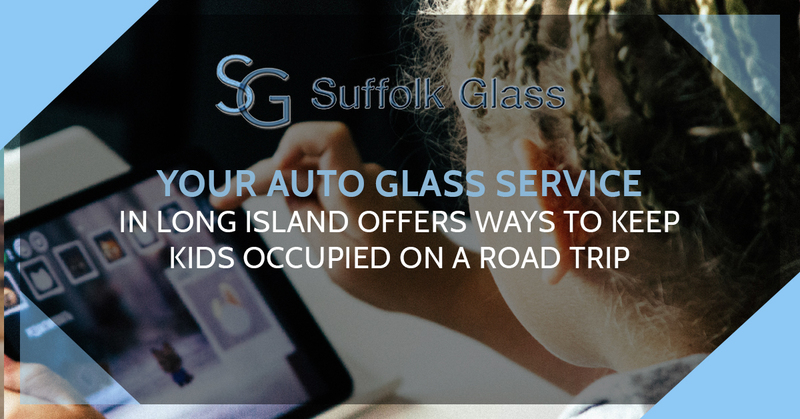 Suffolk Glass, your auto glass service in Long Island, offers ways you can make car travel easier with kids. Technology is a beautiful thing when traveling with children. In this day and age, there are any numbers of ways in which your children can watch cartoons and movies while driving through four states. Television screens are everywhere these days including on our smartphones, on tablets and laptops and on mini DVD players built to attach to the back of your car seats. This means your kids can spend hours watching all of their favorite programs while mom and dad enjoy the peace and calm of a car full of occupied kids. Again, it’s technology to the rescue. If your kids have smartphones or borrow yours, there are literally thousands of games they can play to stay occupied. If smartphones are not an option, there is a huge range of electronic games you can pick up online or at a store. While television shows and electronic games aren’t the most creative activities your kids could be doing, at least they stay occupied and you get to keep your sanity while on vacation. There are quite a few road trip games that kids stuck in cars have been playing for generations. These are simple games that children of most ages enjoy and can keep them occupied for a long time. These games include License Plate Lingo, Car Counting and I Spy. The Slug Bug game is iffy because there is violence involved, play at your discretion. Dad is the one who usually suggests this game. The Quiet Game is quite simple really, the winner is the child who can remain the quietest for the longest period of time. Each road trip, dad hopes the old record for longest stretch of silence is broken. In dire situations, when nothing else seems to be working, you can bribe the children with food or toys. Before you leave on your vacation, pick up several toys, treats or anything else your kids would love to have. Keep them hidden and secret until your children are ready for mutiny, then bribe them with offerings of toys and treats. Be sure you have your windshield checked before heading out on the road. Call Suffolk Glass today.